A trio of photos out of China claim to show the rear shell of Apple's next-generation iPad Air, which looks to feature larger speaker holes, recessed volume control buttons and a repositioned rear-facing microphone. 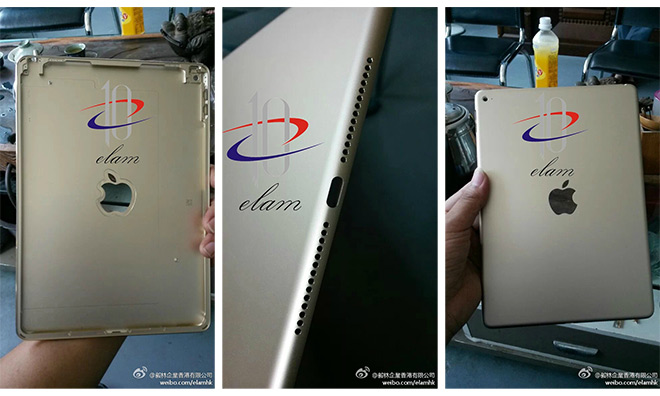 Images of the supposed "iPad Air 2" chassis, uploaded to an account on China's Sina Weibo microblogging site this weekend and subsequently spotted by Nowhereelse.fr, detail a part consistent with a non-functional mockup first revealed in June. Aside from internal structures like screw anchors and mounting brackets for what will assumedly be the tablet's camera, physical control and sensor component suite, the metal chassis is nearly identical to the dummy model. Taking a closer look at the shell reveals the same external recess thought to house the iPad Air's usual pill-shaped volume buttons, making the controls nearly flush with the surrounding structure. Like the mockup, the purported part does not have space for a "mute/orientation lock" toggle switch as seen on current iPad and iPhone models. Instead, a small pinhole is located above the volume buttons, the purpose of which is not yet known. Around back, the microphone porthole has been relocated to sit just beside the rear-facing camera, while the Apple logo cutout first seen with the iPad mini with Retina display makes a return. Currently, Apple fills the space with radio-transparent material to ensure on-board communications hardware can suitably transmit and receive Wi-Fi, cellular, GPS and other signals. The final design tweak appears to be larger speaker holes arranged in a single row flanking a central Lightning connector port, unlike the current two-row grille design seen on current iPads. While not much is known about the next-generation iPad Air, many expect the forthcoming tablet to come with a faster "A8" processor, minor performance increases and the inclusion of Touch ID fingerprint scanning. In April, a batch of photos suggested the future device will feature a bonded display like existing iPhone products, though the claim has gone unsubstantiated.